The wonderful thing about blintzes is their versatility. You can use them rolled around a vegetable or liver filling, or as pasta in a soup or as the base of a vegetable casserole. Additionally, they freeze beautifully. In a large bowl, whisk together the eggs, potato starch, water, oil and salt until smooth. Heat a drop of oil in a 10-inch non-stick skillet set over medium-low heat. Using a full ladle of batter (about ¼ cup), pour the batter into the heated skillet, tilting the skillet so that the batter covers the entire surface. Cook until slightly golden on the underside. Flip; cook for a few more minutes until golden on the underside. Remove to paper towel-lined plate. Repeat with oil and remaining batter. (Blintzes can be wrapped with plastic wrap and refrigerated for up to 24 hours before filling). Place 1 blintz on work surface. 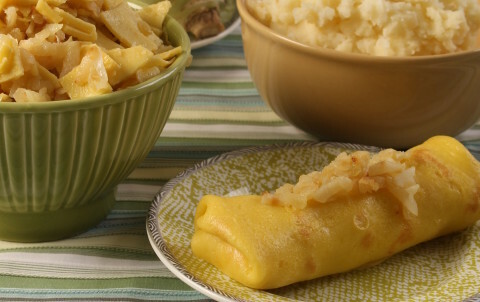 Spread two heaping tablespoons of your favorite mashed potatoes down the center of the blintz. Fold the top of the blintz over the filling and then fold the bottom of the blintz over. Then fold in the two sides. Either freeze or serve with sautéed onions. Feel free to substitute the same amount of chopped liver, sautéed mushrooms, julienned sautéed vegetables (except for squash which will exude too much water) for the mashed potatoes. Sauté 5 heads of peeled and shredded kohlrabi (I use the thick shredder on the food processor, not the one which has the thinner holes) in ¼ cup of oil in a skillet set over medium heat until slightly wilted. Then season to taste with salt and pepper. Add 1 to 2 tsp of sweetener, if desired. Stir in about 20 blintzes, which have been cut into cubes. Cook, stirring, until the blintzes are heated through. 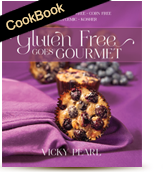 This entry was posted on Apr 24, 2014 by Vicky Pearl.